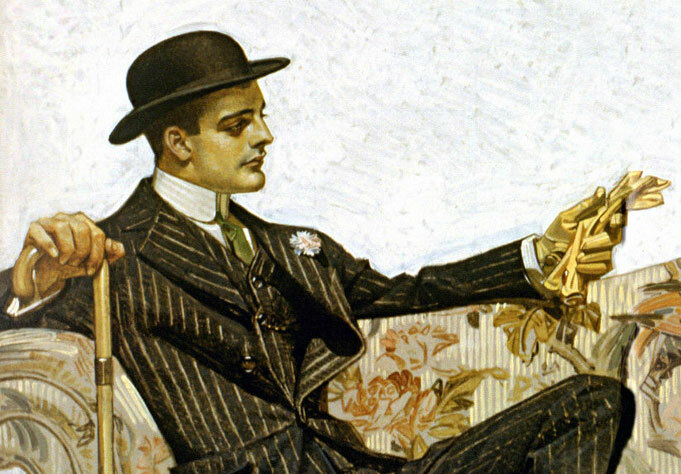 J.C. Leyendecker art. Arrow Collar advert. I am currently writing a horror/historical novel set in the Victorian and Edwardian underworld of Manhattan’s Lower East Side. Gentlemen of those eras deserve their exclusive space on the web ran with the touch of a lady! The keywords for this blog are handsome, menswear, funny, brave, romantic and bad boys. While my blog most always features handsome gents, I also collect photogenic couples, teens and boys and other miscellaneous photographs of the eras I find funny, enlightening or gangsterish. I also own most photographs. The ones I do not own are not watermarked -simple. I ask that you do not use the watermarked photographs from my collection on your blog/site unless you give credit with a direct link to my blog. I scanned the photographs in this collection and digitally enhanced them for your enjoyment. I would like the content of my blog to remain unique. However I don’t mind my visitors sharing my posts on Tumblr or other social networks if the link remains and the URL watermark stays. I’m not a fanatic with the state of the photographs I collect, being more interested in the subjects themselves. As said before, I digitally retouch to correct stains or tears. With this said, enjoy! Drop me a line if you’d like to contact me privately. It may be a little while before I answer.